SURIN (AP) – The Monkeys won in dramatic fashion over the Tigers with a 6-5 walk-off win Thursday afternoon in Tambon Thepraksa. Down 5-4 entering the final inning, the Monkeys rallied for two runs, the last coming on a double to right field. The Monkeys were unaware of their victory until it was explained by facilitator Jeff Jackson in poor Thai. Following the team’s understanding, they all received double-high fives from Jackson. Jackson was pleased with both teams following the six or seven inning game. “They understand more and more every week,” Jackson said moments before escaping a coming downpour. “However, there’s plenty to learn yet. The fielders need to learn not to stand on the bases and the runners need to learn not to run on fly balls with less than two outs. The facilitator from America is already looking forward to next week’s matchup of the Monkeys and Tigers. I also have to add a story from last week’s game. There were huge storm clouds rolling in and the players didn’t seem to think it was going to rain. About 15 minutes into the game, the downpour began. All the kids on the field playing soccer ran for cover. The girls playing volleyball did the same. My player didn’t move despite the 10-minute storm. I paused a moment to see if anyone wanted to get out of the rain. I turned to home to pitch with rain dripping over the bill of my Twins cap and my t-shirt soaked as if I jumped in a pool. In the distance the sun was shining and a rainbow stood in the background. As I pitched the water-logged tennis ball I couldn’t help but think, This is what I wanted when I joined the Peace Corps. 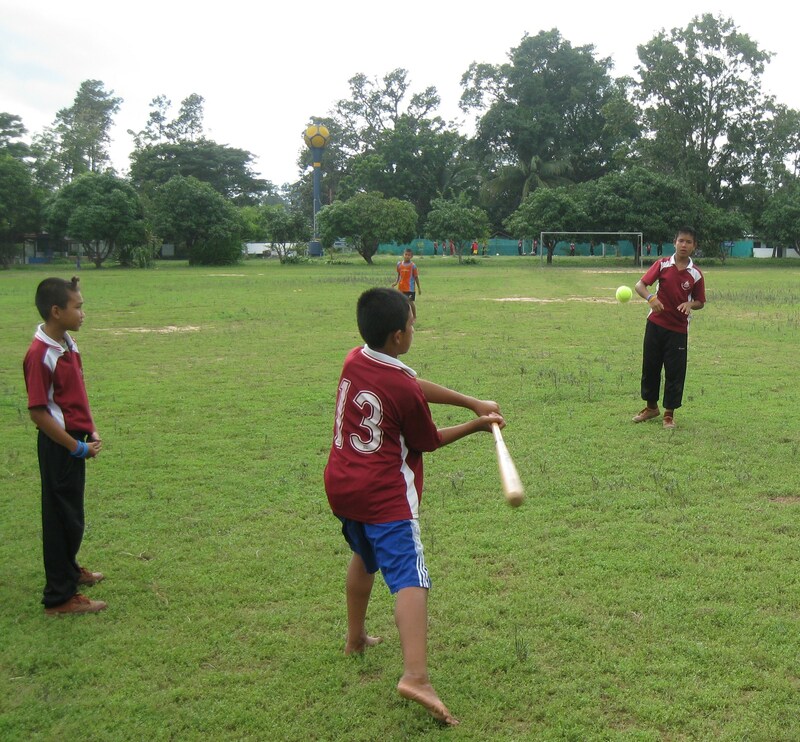 I’m getting drenched during the rainy season of Southeast Asia with 20 kids who can’t wait to play baseball every Thursday.